Over-the-top movie and TV revenues in Sub-Saharan Africa will climb from US$223 million in 2018 to US$1.018 billion in 2024, according to Digital TV Research stats. The research states that subscription video-on-demand revenue is already the main driver for OTT TV and video “by some distance” and that SVOD revenues will reach US$782m by 2024 – nearly a fourfold increase on the 2018 total. 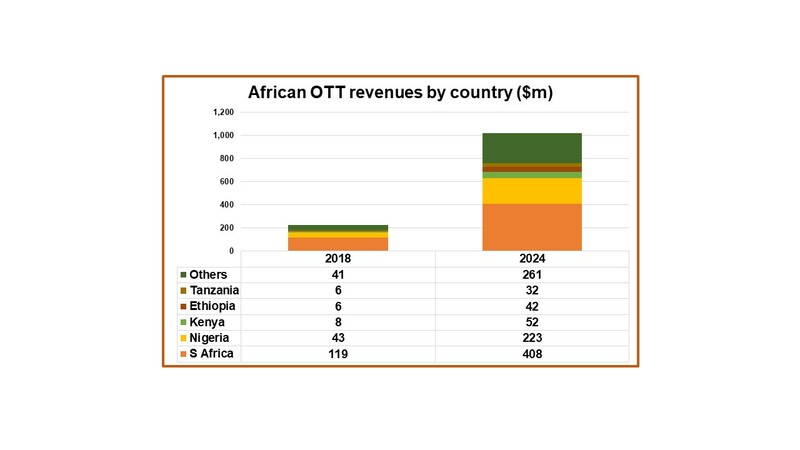 SVOD subscriber numbers in the region are tipped to grow from 3.03 million at the end of 2018 to 10.21 million by 2024, with South Africa expected to remain the leader with 3.46 million subscribers by 2024 followed by Nigeria with 2.56 million. South Africa and Nigeria combined accounted for an estimated 71% of the region’s SVOD subscribers last year. Digital TV Research expects this to decline to 59% by 2024, indicating growth in the region outside of the two main SVOD markets. In terms of platforms, Netflix is expected to remain the dominant player in the Sub-Saharan SVOD market, accounting for 39% of the region’s SVOD subscribers in 2024. While this is down slightly from a 45% share of subscribers in 2018, Netflix’s proportion of SVOD revenues are tipped to stay roughly flat at around 64% of the region’s total. 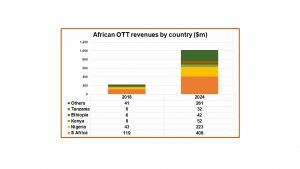 Overall across the wider OTT market, South Africa is expected to account for 40% of the region’s revenues by 2024, some US$408 million, while Nigeria will account for a further 22% (US$223 million). Only 15 of the 35 countries covered by the report are expected to generate OTT revenues of more than US$10 million by 2024.